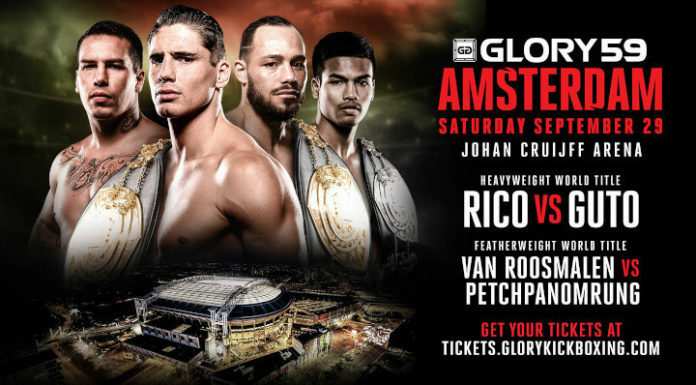 GLORY Kickboxing returns to Holland this coming Saturday September 29. The event No.59 takes place at Johan Cruijff Arena in Amsterdam featuring a pair of championship bouts. In the main event Rico Verhoeven (54-10, 16 KO) defends his heavyweight title for the eighth time. Going through the ropes in his home country he faces Brazilian Guto Inocente (35-8, 17 KO). In the co-main event the current featherweight titleholder Dutch Robin van Roosmalen takes on the interim champion out of Thailand, Petchpanomrung Kiatmookao. The pair battles out in the championship unification. The announced fight card also includes a heavyweight battle between D’Angelo Marshall and Jamal Ben Saddik. In addition, Tyjani Beztati takes on Christian Baya at lightweight. GLORY 59 also includes a five-fight Super Fight Series programme, and a four-fight preliminary card. The official weigh-in ceremony is conducted a day before the fight show. The full lineup can be found below.